On Wednesday afternoon the inhabitants of Arborfield, Newland and Barkham combined in an effort on behalf of church and school funds, and with efficient organisation and general enthusiasm the fete and sports arranged were carried through with the zest necessary for the enjoyment of the large number of visitors. 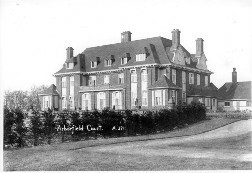 The function was held by kind permission of Mr K L C Prescott, of Arborfield Court, in grounds eminently suitable for the occasion. Mr Prescott also threw open the beautiful gardens of the Court to the visitors. The main object for which funds are required is the repairing and redecorating of Arborfield Church of England Schools; any surplus will be handed to the Arborfield and Barkham parochial funds. The weather on Tuesday was most unpromising, but happily Wednesday broke bright and warm, and throughout the day the conditions were delightful. Ample entertainment and amusement was provided for the visitors, including a programme of sports, in which the humorous element predominated. Entries were capital, and both competitors and spectators entered whole-heartedly into the fun. The Rev. J A Anderson and Major Morris were the judges; the sports committee were Messrs. Frank Bryant, H Empson, E Bowyer and A Parsons. During the afternoon a capital concert was given in a large marquee, the artistes being Mrs Giles Ayres, Miss Clutterbuck (both of Reading) and Major Morris, whilst Morris and Country Dancing was prettily executed by scholars of Arborfield schools. Hoopla, Mrs Prescott and assistants. Refreshments were provided under the supervision of Mrs Bentley, who was assisted by Mrs Bentley, jun., Mrs Russ, Miss Edwards, Miss Garrett, Mrs Bishop, Miss Druitt [sic], Mrs Cox, Mrs Rogers, Miss Rogers, Miss Hayward and Mr Cox. Members of the committee were in charge of many amusing and competitive side-shows, including bowling for a pig and ham, kicking the football, bowling, quoits, etc. A baby show was arranged, and for this Dr G Halpin was the judge, being assisted by Miss Skinner and Mrs Pantin. For the younger visitors swinging boats, roundabouts, etc., were provided. The Rev. J A Anderson was the chairman of the committee responsible for the general arrangements, whilst the onerous duties of hon. Secretary were ably carried out by Mr W J Verrall. The committee consisted of Messrs. Jones, Pope, Kent, Parsons, W Cox, Middleton, Seymour, Barnes, sen. and jun., Watts, Clark, Petts, Empson, Grant, Garrett, E Bowyer, F Bowyer, Bryant, Langley, G Bentley, Harris, Humphreys, L Ruffell, E Cox, G Russ, Mattingley, Ward and Bayliss. At night a dance was promoted at the schools, when the attendance was good. Mr Frank Bryant was the M. C., and capital dance music was provided by Mrs Bryant and Miss Kitty Edwards. Rev. P H Ditchfield of Barkham. 2. The local policeman trying his luck in the dip. Miss Bishop, with smiling face, was in charge of the brandip, which was eagerly patronised by the children.